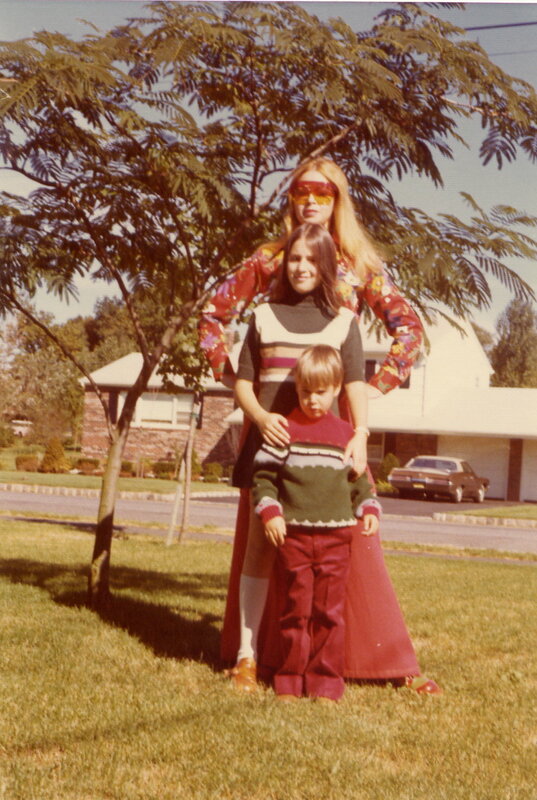 I like the style of this 1973 photo of my children and myself taken in N.J. because it depicts the artistic ununhibited aproach to color of that period. The shirt I’m wearing is in fact a woven cotton bodysuit designed to be worn inside the low-waisted bell bottom pants illustrating the fact that law-waisted pants can be worn without over exposure. Although generally speaking I’m not a flower-prints person, the exceptional color combination of this specific print “took me by a storm” and I just couldn’t leave it in the store. As for the bell-bottom pants I loved the extra width of their hemline which made them appear almost as a maxi-skirt, and their especially long length which balanced their width covering the colorful platform shoes. I believe that the final touch of the large plastic sun glasses in red and yellow adds a glamorous aspect to the look. My children outfits in more subdued shades of red (in fact in wine red) and forest green also express the liveliness of the period’s style. I like the fact that they are sort of matching yet individually different.